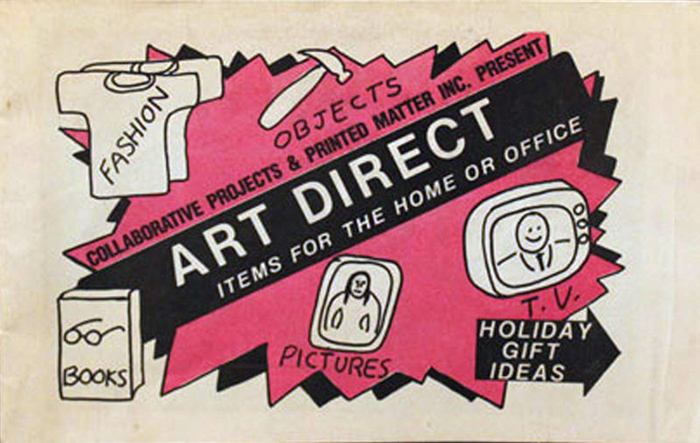 Collaborative Projects, Inc., and Printed Matter, Art Direct catalogue, 1982. Cover illustration by Tom Otterness. If the number of inquiries that Gallery 98 receives from graduate students is any indication, there is much curiosity about the way artists in the 1970s and ’80s sought to democratize the distribution of art. A leader in this effort was the artist group Collaborative Projects, Inc. (COLAB), which sponsored a series of artist-run “A More Stores” to sell low-priced art during the holiday gift season. Printed Matter, Inc., an organization founded by artists to distribute artist-made books, also embraced the idea that art should be affordable and accessible. 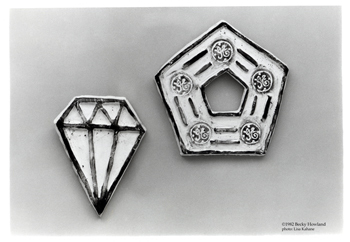 Becky Howland, “Diamond & Pentagon Wall Plaques.” Photo by Lisa Kahane. Gallery 98 features many items from the Art Direct catalogue. Next month, Printed Matter and COLAB will be linked again. Due just in time for the holidays is the much-anticipated A Book About Colab (and Related Activity) by Max Schumann, recently appointed director of Printed Matter. Tom Otterness, “Zodiac Love.” Twelve plaster sculptures, 1983. Originally sold through Art Direct catalogue.